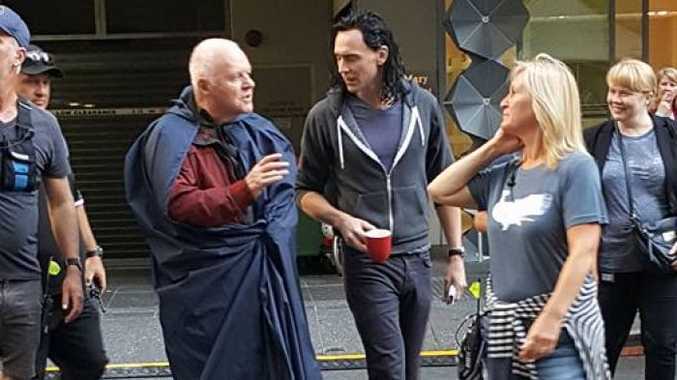 Sir Anthony Hopkins has joined fellow Thor cast members Chris Hemsworth and Tom Hiddleston on the Brisbane set of the Marvel superhero movie. The 78-year-old actor, who plays Odin, father of Hemsworth's Thor and adoptive father of Hiddleston's Loki in the film series, arrived on the closed set for Thor: Ragnarok this morning. 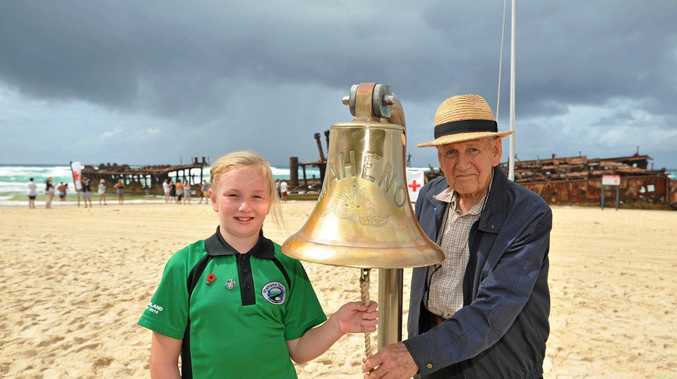 Brisbane woman Jess Moller-Nielsen said Sir Anthony's appearance came as a surprise to her and everyone else around watching, the ABC reported. "It was just Thormazing. They were all keeping pretty low-key so I was thrilled to see Chris and Tom this morning, but when Anthony Hopkins came out of the hotel too I was just over the moon," she said. "He's a brilliant actor, one of my favourites, and it was incredible to see him standing just a couple of metres away from me. "To be honest I don't know if anyone else realised it was Anthony Hopkins because I seemed to be the only one taking a photo." Thor and Hollywood come to Brisbane: Chris Hemsworth and the crew of the latest Thor movie take over the CBD. Meanwhile, Queensland Premier Annastacia Palaszczuk has called on the Prime Minister to urgently increase the Federal Location Tax Offset, to help attract even more major film and television productions to Queensland and Australia. The Premier said more than 1000 Queenslanders are currently working on sets for film productions, including Marvel's Thor: Ragnarok, across the State. Visiting the set of Marvel blockbuster Thor in the Brisbane CBD on Tuesday, Ms Palaszczuk said film and television productions drawn to Queensland created local jobs and generated an estimated $218 million in local expenditure last financial year. "Last financial year was Queensland's best year in terms of attracting production expenditure since 2002-03 - a record year - of $233 million," the Premier said. "For Thor: Ragnarok, Marvel will spend more than $100 million in Queensland on local jobs, goods and services. Thor has already employed more than 1200 Queenslanders. "I want to create a permanent pipeline of major film productions here in Queensland, and from my conversations with studio executives, they want to come here too. "But the studios simply won't come if Australia doesn't have a competitive tax system. The one-off increases to the Federal Location Tax Offset from 16.5% to 30% must become permanent. "My Government is doing everything we can. We offer state tax incentives and we have just invested in a new super sound stage at Village Roadshow - the biggest in the southern hemisphere. "If the PM doesn't take action, we will lose these movie productions to England or the US, and we will lose the jobs and economic activity that goes with them." The Premier said Thor: Ragnarok was one of more than 10 current or upcoming productions to be filmed in Queensland. Other productions include The Butterfly Tree, which included filming in Mt Tamborine, and Blue Water Empire is filming in Cairns and the Torres Strait. Other recent films attracted to Queensland, include The Shallows, The Nest 3D, Jungle and Kong: Skull Island. "Screen Queensland has been allocated an extra $30 million over four years." Doctor Strange to feature in Thor: Ragnarok?